Congratulations to the teams that kept out-of-hours activities and services going over the festive season and New Year. The Living Well Partnership (hosted by Mosaic), the Evening Sanctuary, Solidarity in a Crisis out of hours peer support (SiaC, Certitude) and the new 24 hour mental health support line (South London & Maudsley NHS Foundation Trust, SLaM, which is also working with SiaC) – all part of the Lambeth Living Well Collaborative vision to address people’s problems before they reach breaking point. Victoria Glen-Day, Clinical Service Lead for Centralised services, said of the new free support line: “We have had over 700 calls since we launched on December 18 with a vast majority of people offering positive feedback. This includes both new callers and those known to the services, as well as carers and people outside London. 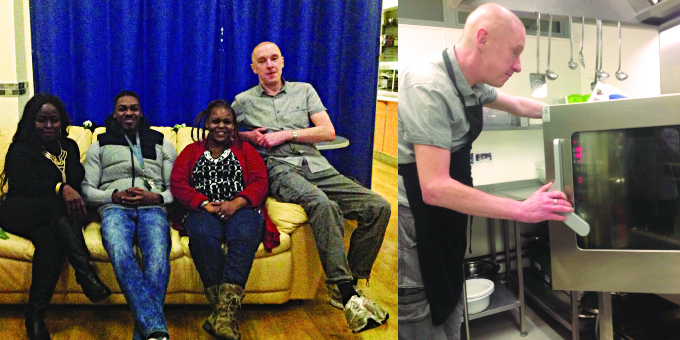 At the Evening Sanctuary on New Year’s Eve, Senior Support Worker Damien Biggam (pictured above right) was busy cooking pizza for the team – (pictured left to right) Solidarity in a Crisis peer supporter Vanessa, Support Worker Michael, and Mosaic member volunteer Mildred; in the background that night was a service user who said he has found support at the Sanctuary invaluable when he is struggling and facing crisis. The team was looking forward to supporting more people and growing Sanctuary hours in 2016. Meanwhile, congratulations to Solidarity in a Crisis who were featured in the South London Press, and on ITV Good Morning Britain on New Year’s Eve. The feature was about how the festive season can be especially difficult for many and services and support like this can make such a great difference and also help to break the stigma of mental health. We are sorry to report that Damien, featured in this story passed away in May 2018.